Providing a unique take on dining storage is this flashy contemporary style buffet. 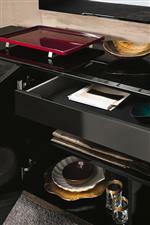 The storage piece contains three drawers and three doors for a variety of storage options to meet your needs. 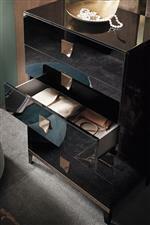 A high gloss black finish is complemented by bronze finished hardware as well as a band along the base. The bold modern style and versatile storage make this piece perfect for your dining space. The Mont Noir Buffet by Alf Italia at HomeWorld Furniture in the Hawaii, Oahu, Hilo, Kona, Maui area. Product availability may vary. Contact us for the most current availability on this product.